Kovai Kings vs Trichy Warriors is the battle of the day in the Tamil Nadu Premier League (TNPL) on August 14, Monday. Kovai Kings having great arrival of Murali Vijay which is big boost for the team. While his team is spotted at the fifth position with six points. Also, the team is situated in the position of middle, it mean, if the team wins this match then it is great to see them in playoff. So, they needs only win to leapfrog fourth positioned Thiruvallur Veerans. Already three other teams in TNPL 2017 were confirmed to Playoff, they are Chepauk SUper Gillies, Tuti Patriots and Karaikudi Kaalai. Due to harsh weather during the match of Kovai Kings, two of six matches were abandoned. On this Saturday, Vijay’s run is the biggest positive for his team. They faced and defeated Thiruvallur Veerans with the 196 total run of the team. 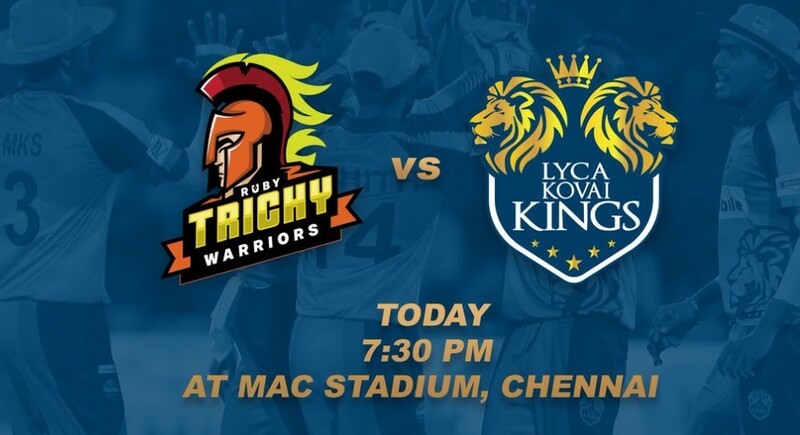 Final League match of this season – Lyca Kovai Kings vs Ruby Trichy Warriors. Trichy Warriors won the toss and elected to bat first. Also, the team having other great batsman such as Suryaprakash and Anirudh Sita Ram. They both doing well in this season of TNPL 2017. In bowling, the team having Krishnamoorthy Vignesh, he is giving more struggle to his opponent team. Kovai Kings XI: Vijay, Surya, Anirudh, Rohith, Harish, Akshay, Mohammed, K Vignesh, Arun, Ajith, Gowtham. Trichy Warriors XI: Indrajith, B Shankar, Nilesh, Kousik, A Ganesh, A Srinaath, M Prabhu, Kaushik, K Vignesh, J Moses, Aditya B.
Lyca Kovai Kings opponent of the day, Ruby Trichy Warriors have already won only one match out of six matches in this season so far. So, the team scored only two points in total and standing at the seventh position. While Madurai Super Giant is the last, who didn’t bag any points by winning a game in this tournament. Baba Indrajith‘s Warriors also like to face the Kings at MA Chidambaram Stadium, Chennai at 7:15 pm IST. Watch Kovai Kings vs Trichy Warriors match Live on TV channels, Star Sports 1, Star Sports 2, Star Sports Tamil, and Vijay Super. Also, Live online with Hotstar.